Potential changes to the contracts of city bus drivers have been branded “draconian, Victorian era” proposals. That was the claim from workers at First Aberdeen yesterday as they and their families held a protest outside the company’s headquarters on King Street. Unite the union claims the changes will mean fewer working hours, decrease in holiday entitlement and a potential wage cut of £6,000 a year. Mike Flynn from UNITE with the protesters behind. And in a statement the drivers criticised the transport firm’s plans and warned of their negative impact. 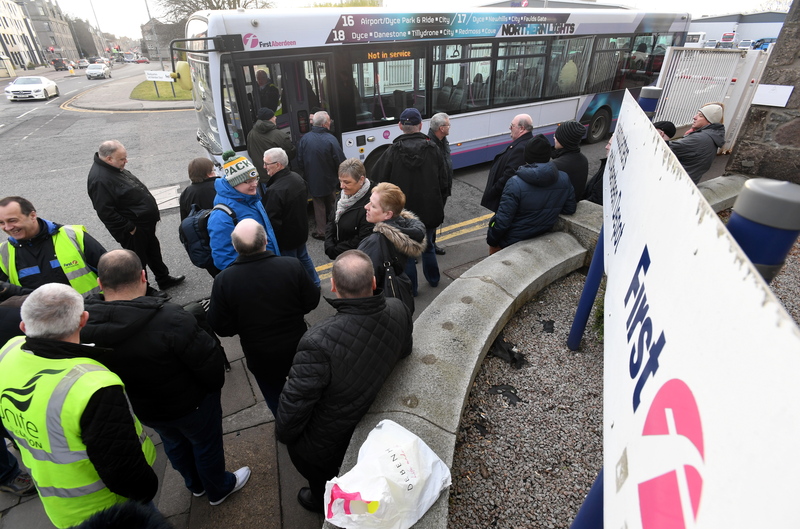 Current staff members were joined in their protest by former drivers and conductors who helped secure better conditions during the 1970s and 80s like holiday pay, pension contributions, overtime entitlement and sick pay. 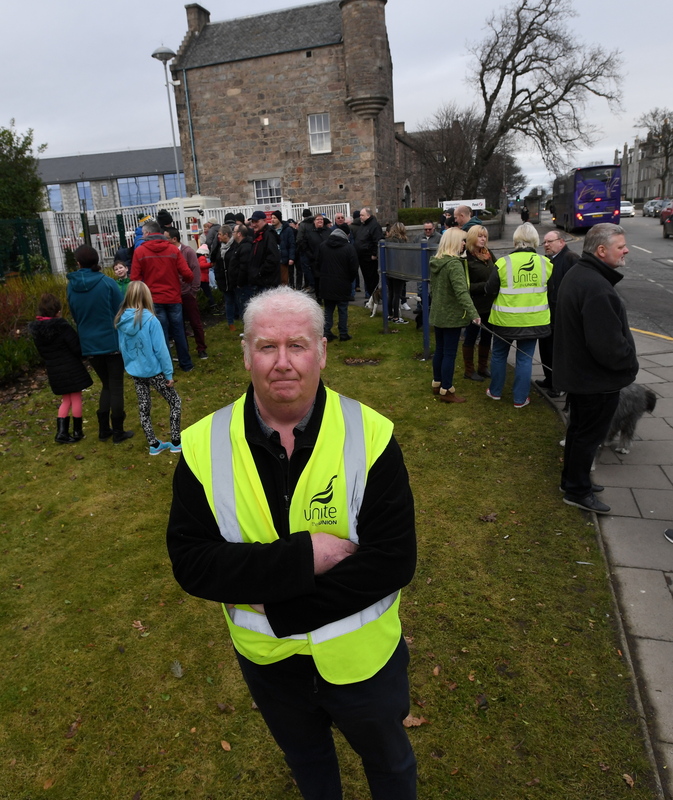 Bus driver Richard Jaffray was among dozens who made their voices heard just yards away from the main gate of First Aberdeen. He said: “People have child care concerns now because their wives might work opposite shifts and mortgages are based are on the pay we get just now. “It is a total mess. They have not thought this through. “I’ve been employed in the bus industry for 36 years and my father was a bus driver before me. 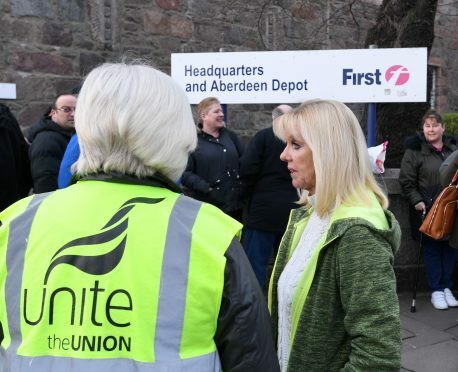 Earlier this month, talks between Unite and First Aberdeen to resolve the dispute broke down. The union have already balloted 260 of their members on whether or not to take the deal, but only four voted to accept it. Unite’s Mike Flinn wants the dialogue between the two to continue as soon as possible to avoid strike action. He said: “First Bus have to get back round the table and take away what they plan to do. “We are all agreed that we maybe have to accept slight changes to the actual contract and we are quite happy with that. “But they can’t just dissolve the contract and bring out this horrendous deal in its place. Ally Davidson, a retired bus driver and First Aberdeen shareholder, was among former employees who joined the protest.